Germany, Palatine (Pfalz). Rupert I, AD 1353 to 1390. Silver Pfennig. Denomination : Silver pfennig. Mint : the Palatine. 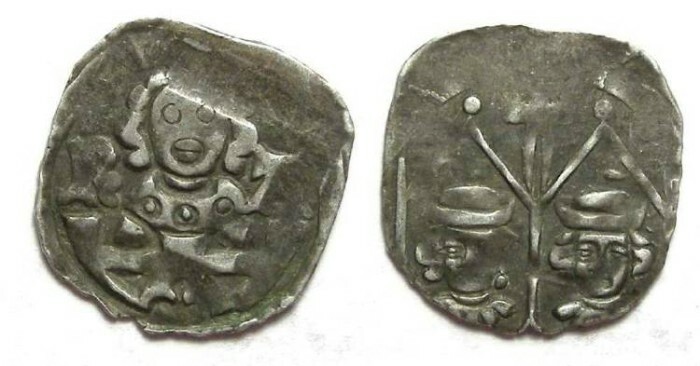 Date : Struck between AD 1353 to 1390. Size : 15.1 x 16.9 mm. Weight : 0.98 grams. Grade : VF but typical weak areas (but actually fairly nice for the type). Obverse : Head facing forward, with R A ot the sides, with the top of a castle wall below. Reverse : Two heads inside of a double gable, with a cross in between (probably a double gabled church).